This weekend, A.V. Club contributor Shelby Fero is watching all of the first season of The Man In The High Castle on Amazon Prime. After she’s finished with an episode, she’ll post a quick response. Though she’s working straight through the season, she’ll be taking some breaks, too, posting three reviews on Friday, four reviews on Saturday, and three reviews on Sunday. Weigh in on this episode in the comments below or discuss the whole season on our binge-watching hub page. The pilot sets out to establish not just an ensemble of characters and plot points, but to begin weaving a complicated web of deception and betrayal at every level of an unstable country on the brink of revolution. At the highest (besides the Fuerher and Emperor), are the Nazi Ambassador and Japanese Trade Ambassador. Then, the local Nazi commanders in New York and Japanese Inspector in San Francisco, who, finally, terrorize the normal, working class civilians—including our two Beautiful Young People leads. It’s ambitious: Setting up inter-locking stories about family, love, friendship, xenophobia, racism, political intrigue… It’s like a “best of” thematic explorations for war novels and sci-fi. The pilot feels slow at first, not trying to hook you right away, but more like coax you gently in. But I appreciate that. And there’s a lot of very deliberate set up, but it has to be done cleanly so all the threads don’t get tangled into one big knot. 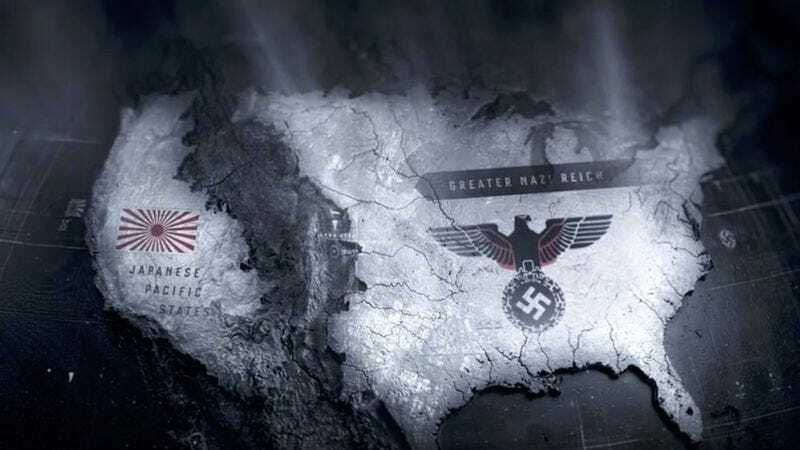 The Man In The High Castle feels like a BBC drama, but for Americans. I didn’t know that was even a possible compliment until now. And, man, I hate on cliffhangers in general, but oh baby was that phone call at the end exciting. I giggled out loud like a toddler, clapping my meaty baby hands together in appreciation for what’s to come. Questions: Is this sci-fi technically? I know it’s “alternate history,” but it occupies a similar feel for me as any other science-fiction story. Do WWI/II historical pieces only use thin, pale, freckled brunettes with gumption as their main heroines? Is that the most scientifically pleasing aesthetic to place against industrial hues of gray? Fears: Is this show racist? Is any of the portrayal of Japanese mannerisms/culture racist? I kind of have no idea. I really, really hope not, because I really like the show. Nazi-controlled New York City. Our “Main Guy.” The handsome, young, All-American boy, eager to join the revolution… but also maybe actually the son of Hitler? Or at least someone high up the Nazi ladder. He’s the hot dude driving the truck. The “Main Girl.” She’s unexpectedly forced into aiding the revolution when her half-sister shows up out of the blue and passes on her own assignment before the police find and shoot her. She’s the white girl doing Aikido at the beginning of the episode. Juliana’s boyfriend and one-time artist. His grandfather was Jewish and he’s particularly nervous about it. He wants to design jewelry. He’s the guy in glasses. I dunno, Juliana’s and Frank’s friend? That’s all I’ve got so far. The Evil Japanese Inspector in San Francisco. He shoots Juliana’s half-sister. He is the Evil Japanese West Coast Police Chief. He is the Evil Nazi Commander in New York, EDIT: Not also Joe Blake’s dad. He is the Japanese Trade Ambassador in San Francisco. He knows the Nazis might start a war again. A mysterious figure who makes and distributes videos featuring its own alternate reality in which the Allied Powers won. These videos are very powerful for people; might be a little silly but I’ll accept it.